When I first started playing blues harp I had a cassette a book by John Gindick, even back in the eighties he wrote that the Hohner Special 20 harmonica was about as far as you could go. He was right and has become my favourite harp ever since! Durable plastic comb with mouthpiece for more playing comfort, recessed reed plates affixed with screws. 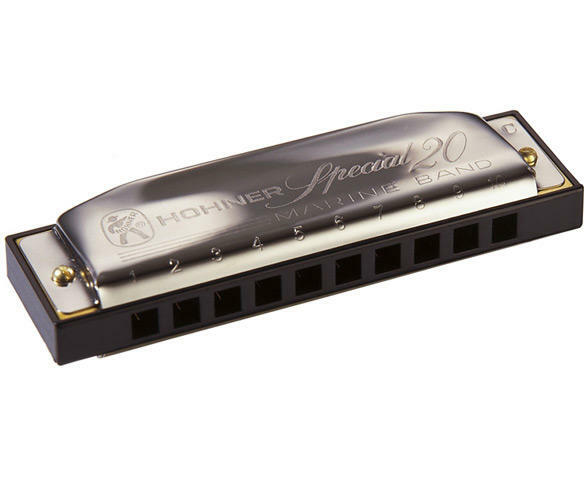 The stable construction and full sound make the Hohner Special 20 one of the most popular Richter tuned models. Airtight, loud and reliable. Check out the great harp player Ben Hewlett in the vid explaining a few things about it. So..the pro's swear by The Hohner Special 20, beginner harmonica players love learning on them too, why start at the bottom. It's just the best beginner harmonica available in the full 12 keys. If you are a beginner the best key to start with is C.
Supplied with box and cleaning cloth.